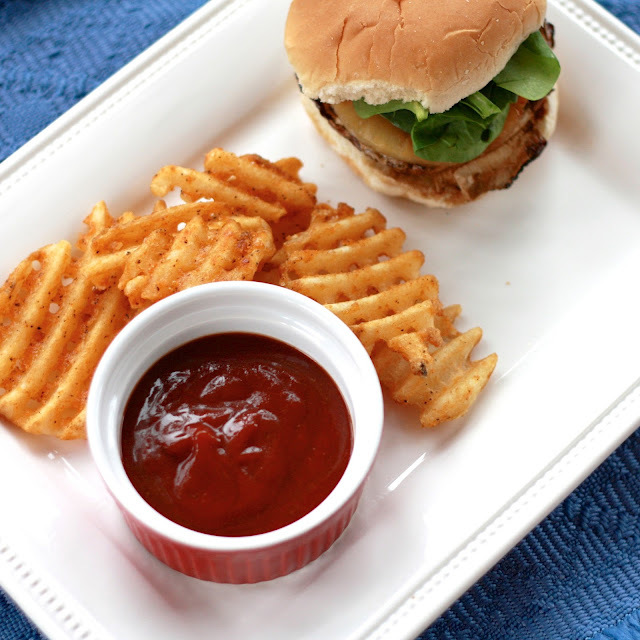 For my fourth Alexia Tastemaker recipe, I knew I wanted it to revolve around their waffle fries. If I'm going to eat regular fries (and by regular I mean non-sweet potato), my fry of choice is a waffle fry. I typically associate them with burgers but since Ryan was gone this weekend and I didn't want to risk lighting myself on fire with the grill out back, I stuck to portobello burgers, which could be cooked on our panini press. If you're wary of veggie burgers, these might be a great place to start. The mushrooms are meaty enough that you can almost be fooled into thinking you're biting into a beef burger. Grilled pineapple and spinach give these a particularly summery feel, even though it was pouring rain yesterday as I made these for lunch. The real star of the meal was the teriyaki ketchup. 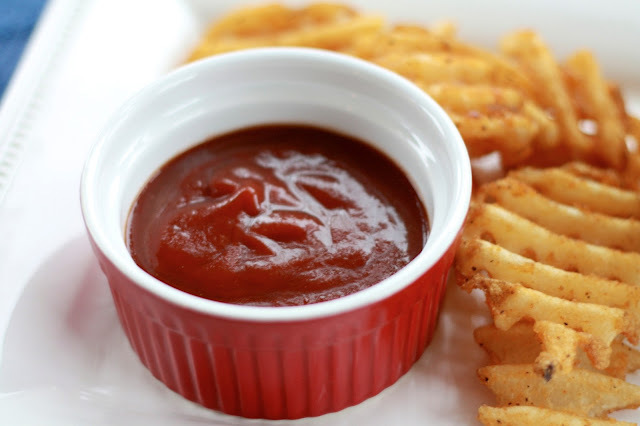 After reducing the marinade over the stovetop and mixing it with ketchup, it makes for a sweet and tangy sauce that was a great accompaniment for both the burgers and the waffle fries. I shared this meal with my sister Renatta and friend Colleen, who was visiting for the weekend, and the two of them decided the sauce warranted a better name than the wordy teriyaki ketchup. It was then dubbed ketchaki sauce, a rather exotic sounding name that actually fits it perfectly. Although I think you could probably find a multitude of uses for the ketchaki sauce, do yourself a favor and give these burgers and fries a try! I've created another Pinterest board to capture some other burger ideas--beef, turkey, veggie...you name it! All would be great with some Alexia fries and ketchaki sauce! Come check it out! 1. Use a small spoon to scrape out the gills on the underside of each mushroom. Use a damp paper towel to gently clean mushrooms and remove remaining debris. Place mushrooms in a shallow baking dish with pineapple rings. 2. In a small bowl, combine 3/4 cup pineapple juice (the rest can be saved for another use), soy sauce, brown sugar, garlic, ginger, and sesame oil. Pour over mushrooms and pineapple, cover, and refrigerate for at least 2 hours or overnight. 3. Remove mushrooms and pineapple from marinade. Pour marinade into a small pot. Add water and cornstarch and whisk, cooking over medium until brought to a boil. Boil for one minute until slightly thickened. Remove from heat and set aside. 4. Grill mushrooms and pineapple, gently flipping once, until hot throughout. Serve on toasted buns with spinach. 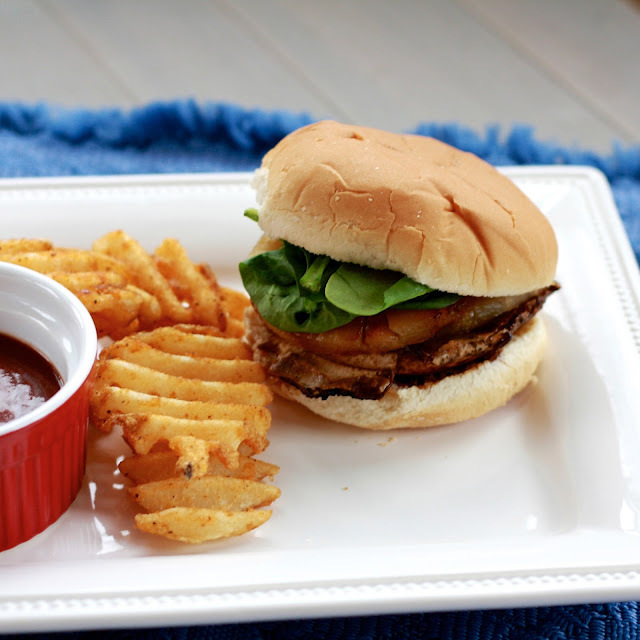 Mix ketchup with a few tablespoons of thickened teriyaki sauce. Serve teriyaki ketchup on burgers and with fries. This post is sponsored by Alexia Foods as part of their Tastemaker Ambassador program. However, all opinions are my own! Don't forget to sign up to be a Tastemaker and earn points to cash in for coupons and prizes!